No Thanksgiving spread would be complete without a delicious stuffing. This year, my family is gathering at my mother-in-law's house for Thanksgiving dinner. We decided to divide up all of the side dishes, and I volunteered to make pies and the stuffing. Here's the thing- I've never made stuffing before. I love stuffing, and am a fan of all different kinds of stuffing. This year, I wanted to put my own spin on the traditional Thanksgiving side dish and dress it up a bit. The thing about stuffing is that there are so many different ways to make it. There are tons of delicious ingredients you can add to enhance flavors. I wanted to use a mix of sweet and savory ingredients in my stuffing, and incorporate fruit and honey, along with fresh herbs to give the stuffing that aromatic 'wow' factor, and kick it up a notch from what we're used to having alongside our turkey and ham. Fresh, quality ingredients make all the difference! I like stuffing that incorporates a lot of non-traditional ingredients and flavors, so I wanted to add yummy bites of cranberry and apple, as well as add in sausage and herbs. 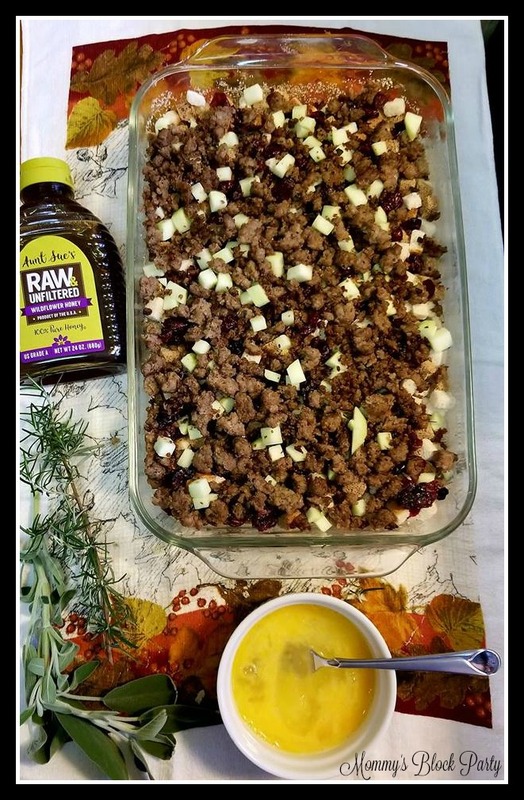 The real star of this delicious stuffing is none other than Aunt Sue's Raw & Unfiltered Wildflower Honey. You might not think of honey as a star ingredient in stuffing, but in this flavorful dish, it really brings out a lot of the other flavors and adds that extra hint of sweetness that I wanted in my dish. Brown the sausage over medium heat and add the sage. First, go ahead and preheat your oven to 350 degrees. While the oven heats up, get your sausage into a skillet and cook over medium heat. Use your spatula to chop the sausage up as it cooks. Add the chopped sage and cook through with the sausage. Remove sausage from the pan using a slotted spoon. 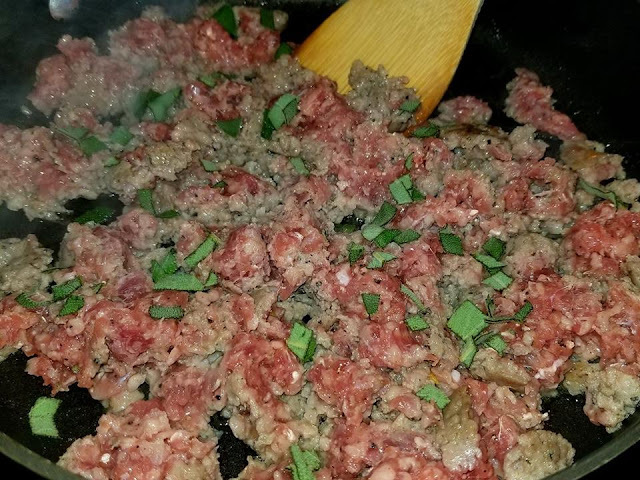 Leave remaining sausage drippings in the skillet. Get the liquids going while the sausage cools down. Add the white wine to the sausage drippings over medium heat. Cook for 1-2 minutes. 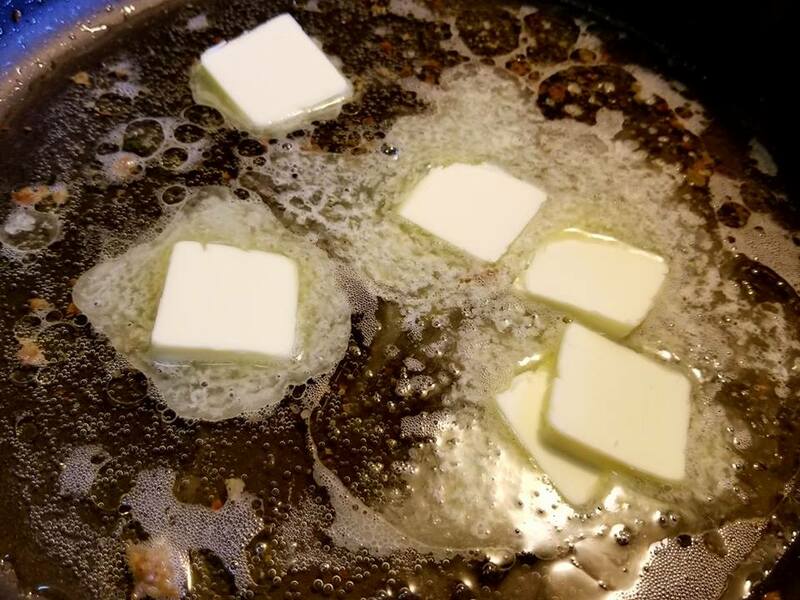 Add the cold butter in thin slices, carefully stirring into the drippings and the wine. Add in remaining herbs (rosemary and parsley). Slowly add the chicken stock, and bring to a low boil for five minutes. Here's where the honey comes into play. Adding just a touch will sweeten an otherwise savory broth for the stuffing. 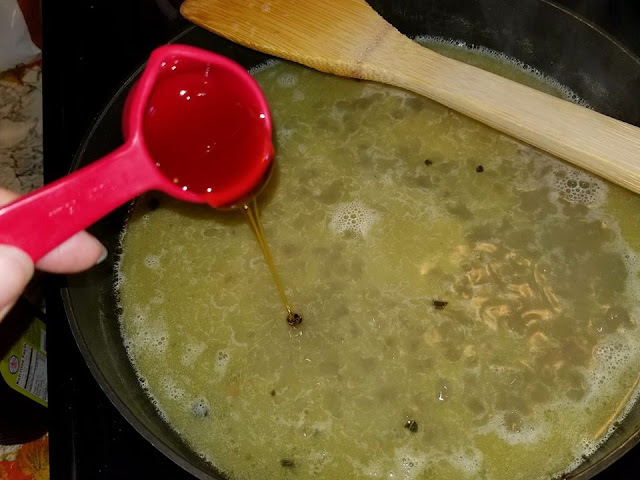 Next, slowly add 2 Tbsp of Aunt Sue's Raw & Unfiltered Wildflower Honey to the boiling broth mixture. Reduce heat and let simmer for five minutes. While the broth simmers, prepare the stuffing. Lightly grease a 9x13 casserole dish. Add in the stuffing (or you could also use toasted bread which has been cut into large pieces). 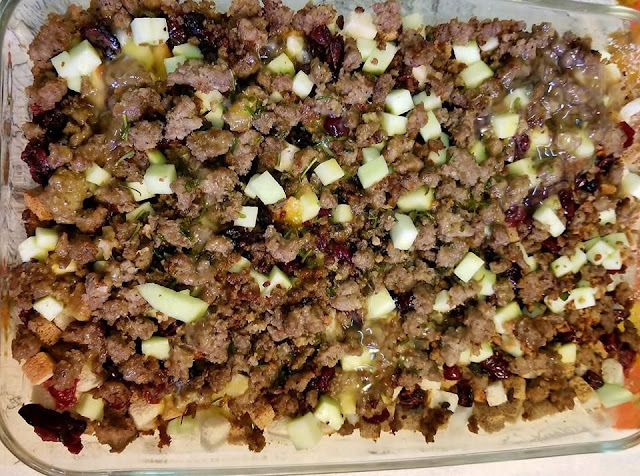 Add the cranberries and apples, toss together. Add the cooked sausage to the casserole dish, and give it a stir. Add the liquid to the dry mix. Slowly pour the broth over the dry stuffing mix. Next, add the two beaten eggs over the top, and gently toss the mixture together, making sure the bread pieces are coated in the liquid. Sprinkle sea salt to taste. 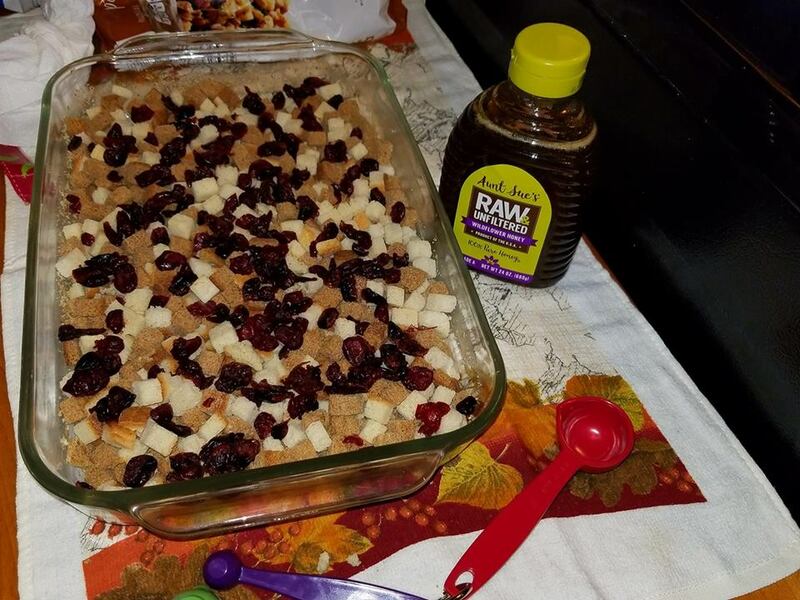 Drizzle the remaining 1 Tbsp of Aunt Sue's Raw & Unfiltered Wildflower Honey on top of the stuffing, and gently mix. Cover the casserole dish with aluminum foil and bake for 40 minutes. Uncover and cook for 10 more minutes to get that nice crisp and crunchy top on the stuffing. 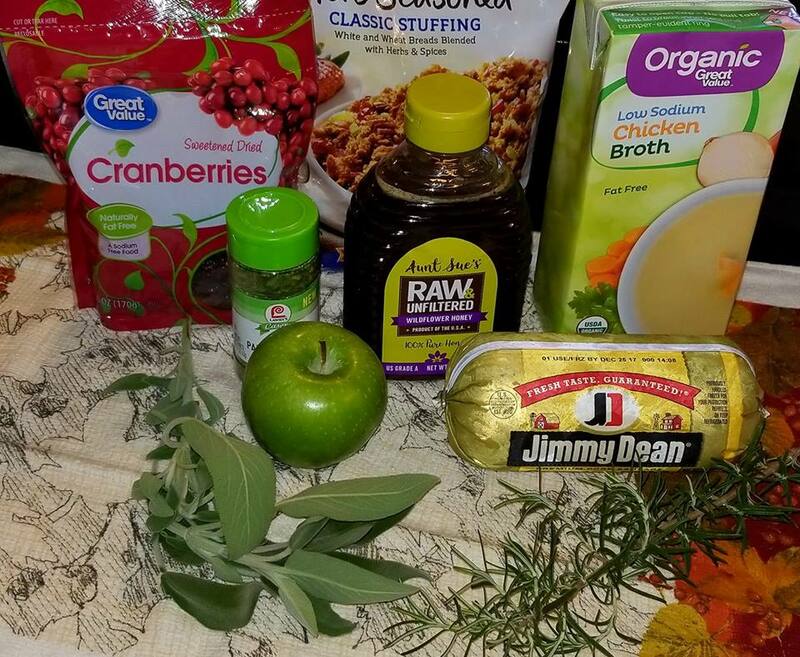 Aunt Sue's Honey makes every ingredient in this delicious stuffing shine. 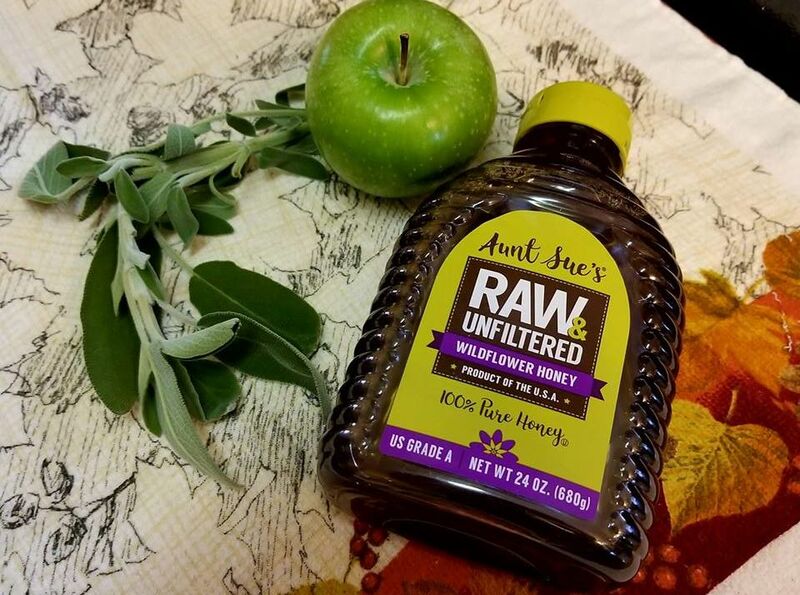 Bring the farmer’s market to your cupboard with Aunt Sue’s Raw Wildflower Honey. Their delicious wildflower honey is pure, pollen-rich, unfiltered and all natural, allowing it to maintain its unique and robust sweetness. Gathered by the independent beekeepers of Sioux Honey Association Co-op, you can rest assured knowing that only the highest quality of U.S Grade A honey reaches your shelf. Aunt Sue's Honey is so good that we've been enjoying it by the spoonful! Everyone in my house was sneaking tastes of the honey while the stuffing was baking. This is the most delicious stuffing I have ever had. My husband worried that it would be too sweet with the fruit and the honey, but it balances and highlights the sausage and the herbs so beautifully. 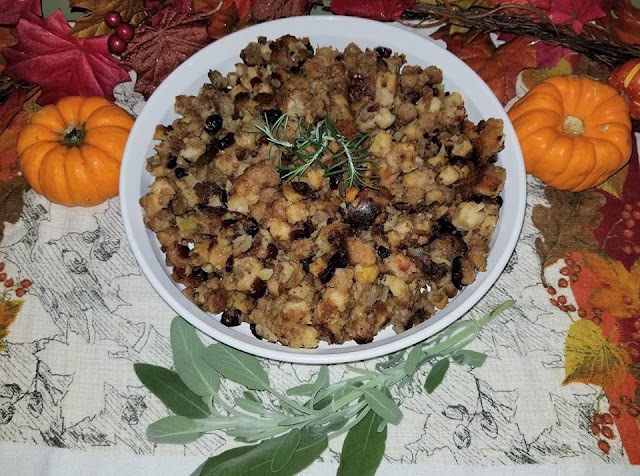 I can't wait to dish this delicious stuffing out for my family on Thanksgiving Day, and I have a feeling that we'll be enjoying it at many future holiday gatherings.